The Rt Rev. Mark Davies, the Bishop of Shrewsbury, will today urge members of the Latin Mass Society to embrace the forthcoming Year of Faith in order to effectively transmit the “flame of faith” to future generations. Preaching at a Traditional High Mass at the Roman Catholic National Shrine of Our Lady in Walsingham, Norfolk, the Bishop of Shrewsbury will tell the LMS of how the ruins of the Medieval shrine of Our Lady of Walsingham serve as a reminder of what was lost during the Protestant Reformation. The light which was extinguished in Walsingham was not only England’s renowned devotion to Our Lady “but the light of that flame which pointed night and day to the Real Presence of Our Lord, truly God and Man, in the Blessed Sacrament of the Eucharist”, Bishop Davies will say. It was therefore vital that the Church deepens its faith today by accepting with enthusiasm the invitation of Pope Benedict XVI to celebrate the Year of Faith that will open on October 11 – the 50th anniversary of the opening of the Second Vatican Council, he will say. Quoting the Holy Father, Bishop Davies will encourage the LMS pilgrims use the occasion to “profess the faith in fullness and with a renewed conviction” and to “intensify the celebration of the faith in the liturgy, especially in the Eucharist”. 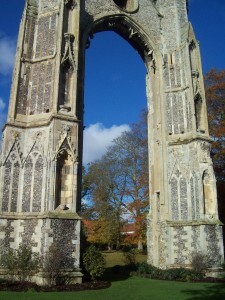 His homily will be delivered just a mile from ruins of the original shrine, the end of a three-day, 55-mile walking pilgrimage by the LMS that began in Ely, Cambridgeshire. The Mass was to be celebrated by Canon Olivier Meney of the Institute of Christ the King Sovereign Priest and rector of the Shrine Church of Ss Peter and Paul and St Philomena in New Brighton, Wirral, which falls within the Diocese of Shrewsbury. Canon Meney took part in the Walk of Pilgrimage.